Prince William and Kate Middleton are now feeling more concerned than ever before that reports of an affair between William and Kate’s rural rival Rose Hanbury might become an explosive new scandal. As a matter of fact, one tweet by a British food critic by the name of Giles Coren has raised a lot of eyebrows following reports that suggested the Duchess of Cambridge wants to ‘phase out’ Rose, who she has long considered to be a close friend. 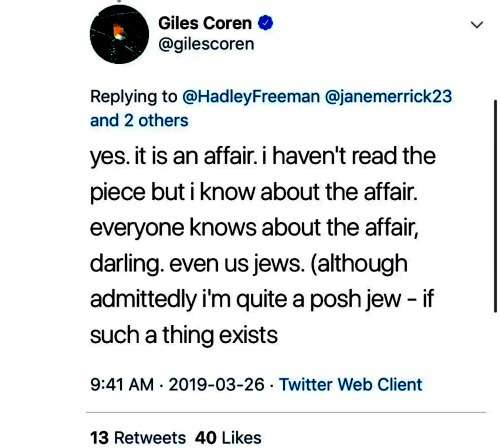 Giles Coren wrote in a tweet on Tuesday, March 26 that he supposedly knows about an affair between the future King of England and Hanbury, who is also known in social circles as the Marchioness of Cholmondeley. Even though he calls it an affair, Giles Coren doesn’t offer any more details about Prince William and Rose Hanbury’s affair or the ex-model’s feud with Kate Middleton for that matter. It was reported earlier this week that Kate Middleton views Rose as a rival. Prince William, meanwhile, has been reportedly acting as a peacemaker between the two women as he doesn’t want their rift to get out of hand. He is also good friends with Rose’s husband, David, the Marquess of Cholmondeley. The Duchess of Cambridge is apparently so upset behind the scenes that she wants Rose banished from their posh social circle of friends in Norfolk. So far both Prince William and Kate Middleton have made no comments about the affair reports, however, it’s very unlikely that anything will be said at this point. The Duchess of Cambridge put on a very big smile during a royal engagement with local scouts at their official headquarters in London this past week. The last time that the Price William and Kate Middleton made a public appearance together was on St. Patrick’s Day. Otherwise, the royal couple have been sticking to their own separate schedules, in hopes that the affair reports will eventually die out in the media.